This retractable pen like stylus is hard to beat for hand engraving lines for text and decorative art work on soft, bone dry and fired metal clays. 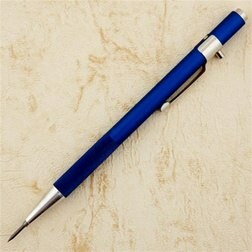 Just press the back end of the "pen" to extend the tip and to retract, press the button on the clip. The tip is a VERY sharp hardened point so the retractable feature is great to protect the point - and you! All metal clays can be engraved with this pen in all their states - soft clay, bone dry and fired. However, it is best to engrave bronze clays before firing because bronze is so hard!